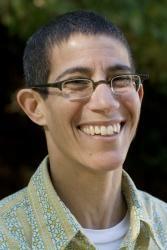 Deborah Gould is an Associate Professor of Sociology at UC Santa Cruz (and Affiliated Faculty in Feminist Studies, History of Consciousness, and Politics). She received her PhD from the University of Chicago in Political Science in 2000 and was a post-doctoral Harper-Schmidt Fellow in the Society of Fellows in the Liberal Arts at the University of Chicago, 2000 – 2004. Her first book, Moving Politics: Emotion and ACT UP’s Fight Against AIDS (University of Chicago Press, 2009) won the Distinguished Contribution to Scholarship Best Book Award from the American Sociological Association’s Political Sociology Section (2010), the Ruth Benedict Book Prize from the American Anthropological Association (2010), and was a finalist for the Lambda Literary Award in LGBT Studies (2010). She is currently working on a second book, also about political emotion, called Appetites, Encounters, and the Not-Yet of Politics: A Solidarities Project. She was involved in ACT UP/Chicago for many years, and later in Queer to the Left, and was a founding member of the research/art/activist collaborative group, Feel Tank Chicago, most famous for its International Parades of the Politically Depressed. Political emotion and affect, social movements and contentious politics, classical and contemporary social theory, sexualities, lesbian/gay/queer studies, feminist and queer theory. For more about Professor Gould’s research, please click on the “Research” tab above.